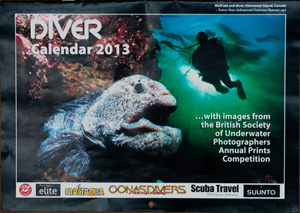 The DIVER Calendar 2013 is out and my photo of a wolf eel and silhouetted diver is on the cover. The calendar is available with the January issue of DIVER magazine. The DIVER Calendar 2013 features images from the British Society of Underwater Photographers (BSoUP) annual print competition held at the NEC Birmingham in October 2012. The calendar cover is my photo of a wolf eel taken at Vancouver island in Canada and the silhouetted diver in the photo is model Paula Bailey. The calendar was available with the January issue of DIVER magazine purchased from a shop or news stand.